I track the seasons by what's in bloom, and right now we have daylillies, hydrangeas, blackberries and monarda (bee balm) all around us. It's been beautiful weather lately (finally!) and after all the rain we had before, everything is blooming lush and full. wonderful collage! that's what I miss about living away, the colours of the flowers and trees. not much of that here in KL. Very nice! I hope you had on a long sleeved shirt if you were picking any of those blackberries! Great colours. 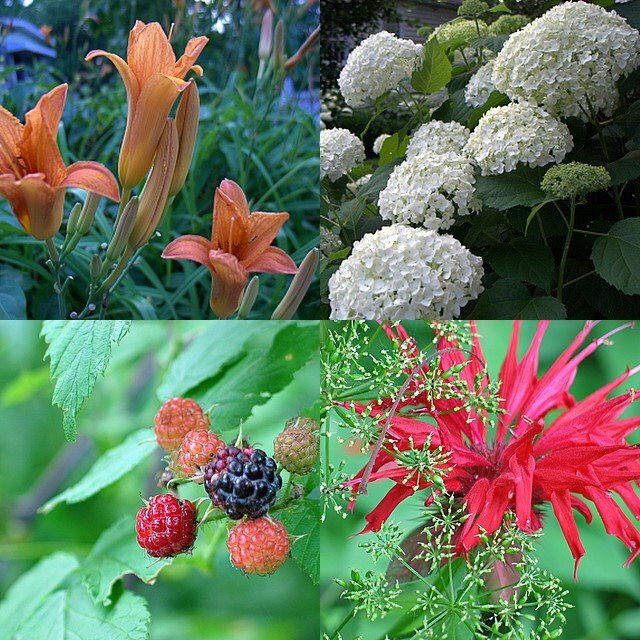 We have all the same except the flower in the lower right hand corner, monarda (bee balm). I always love your flora shots (the tulip earlier in the season was such a breathtaking and memorable shot!). These are just gorgious! Quilt artist Ruth B. McDowell has wonderful quilts of lillies this color and of bee balm (I have a link to her work on my page). May I ask what camera and lens types you use for your flower shots? Really wonderful! wow - you have summer flowers too - like Akita Japan! Very nice! !